Ruby the Airedale: Happy Burthday Doods! Can you believes it's our Mayorz' Burthday todays??! Yes! They are most handsome!!! Wows, he gots some MOVES! HAPPY HAPPY HAPPY BURTHDAY DOODS!!!! They are a couple of good looking Doodz!! We say Happy Birthday too! Of course you made them 'ritas. Crikey ...... those moves are amazing!! It sure is nice of you to be wishing the Doodz a happy birthday!! We'd celebrate, but we don't have any ice cream....or margaritas. 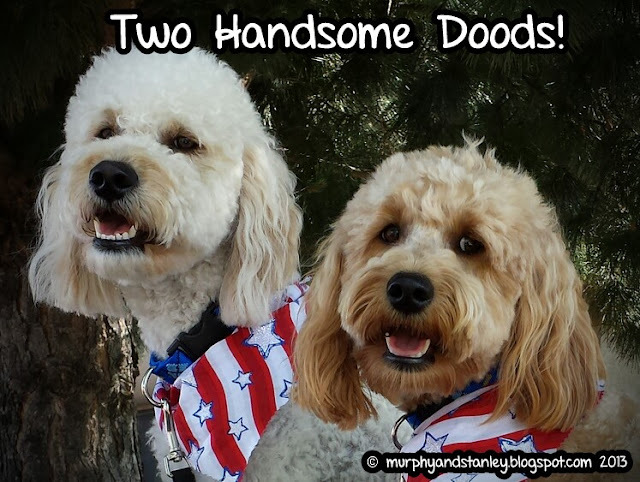 Happy Birthday, Murphy and Stanley! We couldn't see the MOVES either???? GRRRR!! We just know it was a fun video. Happy Birthday to Murphy and Stanley!!! They do look like a couple of GQ pups. What a lovely birthday tribute to the Doods! We were blocked too but we remember y'all twerking at the big dance! BOL! BOL! Great a great birthday tribute to the doods! OMD we can't see it either. I know you all must have been having a super time. Oh dog...we're late with our wishes...we'd better get over to their blog asap! !